Today I'm dusting off this review I wrote about two and a half years ago and published on Goodreads here (and to date it's garnered the highest number of "votes" of any of my Goodreads reviews, so yay me!). 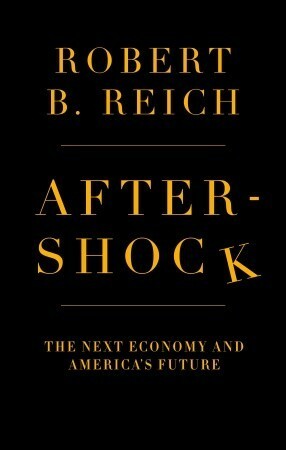 Aftershock is a pretty short book with some grand ideas and Robert Reich can certainly be a polarizing figure, but I found his explanation of the Great Recession to be one of the most clear and understandable I've read. First, a little background. I've always considered myself comfortably conservative, socially, economically, politically. But in my old(er) age (32 and a half or so) when I'm being brutally honest with myself, I'm finding more and more merit in what would have horrified a younger me - a *gasp* more liberal worldview. I'm not really what anyone would call bleeding heart, but the conservative label doesn't really fit anymore either. The issues facing our country and our world today seem too complex to insist on a one-size-fits-all solution that fits neatly in a single party's platform. That being said, I found myself being very persuaded by Mr. Reich's arguments regarding the inequitable distribution of wealth in our system today. He speaks of the "basic bargain" upon which a (healthy) economy is based. Simply put, workers are also consumers. Their earnings are used to buy the goods and services other workers produce. If their earnings are not sufficient to create enough demand to purchase the available supply of goods and services, the economy suffers. Mr. Reich points to both the Great Depression and the recession of 2008 as examples of this occurring. Everyone seems to idolize Keynesian economics, but Keynes himself recognized two faults inherent in capitalism: "its failure to provide for full employment and its arbitrary and inequitable distribution of wealth and incomes." These are still the weaknesses in the system today. Mr. Reich outlines three coping mechanisms that delayed the onset of economic trouble over the 80s and 90s once wages started to stagnate: people worked longer hours, more people (especially women) entered the work force, and finally people started borrowing against their homes and running up consumer debt. According to Mr. Reich, the downturn of the last few years occurred not because (or at least not only because) individuals got greedy and borrowed too much or were too stupid or short-sighted to understand the terms of their loans, but because they had run out of these release valves. The main problem is that, for the majority of Americans, their earnings had not kept up with their reasonable expectations for what they could afford as the economy grew. The basic bargain had been broken. Before my conservative friends blow a gasket and start ranting about personal responsibility and pulling yourself up by your bootstraps and making claims about how they did it all on their own without handouts or guarantees from the government (which, frankly, is bullhonky), let me clarify. Yes, individuals should be more concerned with their personal financial health than "keeping up with the Joneses" or maintaining appearances or purchasing luxuries that aren't truly needs. But more and more it's those "needs" that aren't affordable. Like a home in a decent neighborhood with good schools. Or a college education. Or access to quality health care. Or even the ability to save for retirement. It's human nature to compare yourself to others as a gauge of how you're doing and the conspicuous consumption of the very wealthy is, in some ways, driving this discontent. Not saying that it's "right" but that's how it is. A middle-class family today cannot maintain the same standard of living as a middle-class family of fifty years ago without at least one, if not all three, of the coping mechanisms described above. This country used to be considered a place where someone - anyone - could work hard and make a better life for him- or herself and his/her children. Nowadays that is less and less true. The game seems rigged in favor of the "haves" at the expense of the "have-nots" and that engenders resentment and political discontent. Mr. Reich includes several thinly veiled swipes at the Tea Party or its close cousin which were rather exaggerated and egregious, but captured the frustration and anger that feeds the movement. The very wealthy do have greater access to politicians and policy makers. Besides the incredible amount of money tossed at candidates of both major parties during campaigns, many politicians move on to lucrative private sector jobs as lobbyists or consultants in these very fields they are supposed to regulate. Again, human nature rears its ugly head - you just don't bite the hand that feeds you, or that may feed you very well in the future. Mr. Reich argues that we face both economic and political threats if these challenges are not overcome. "Unless America's middle class receives a fair share, it cannot consume nearly what the nation is capable of producing, at least without going deeply into debt...The inevitable result is slower economic growth and an economy increasingly susceptible to great booms and terrible busts." It should go without saying that this hurts everyone. Politically, we are in danger as well. "Widening inequality, coupled with a growing perception that big business and Wall Street are in cahoots with big government for the purpose of making the rich even richer, gives fodder to demagogues on the extreme right and the extreme left. They gain power by turning the public's economic anxieties into resentments against particular people and groups." Anyone who has listened to talk radio in the last few years can't really argue with that. Trust in the government in general and politicians in particular is at an all-time low and the more outrageous the statements that come from these talking heads, the higher their ratings climb. I'm not ready to jump on board with all of Mr. Reich's proposed solutions - and I don't for a second think that there's actually the political will in Washington, D.C., to do anything remotely this extensive, despite his assurance that this agenda is "practical and doable." But I think that for the economy's sake, and for my future and my children's future, we need to take a hard look at the assumptions we have been holding. They need to be reevaluated in the light of who holds the power and the money and how that meshes with our beliefs in democracy and the opportunity for anyone to work to provide a better future.